[ABRAHAM LINCOLN]. Book. Message of the President of the United States to the Two Houses of Congress..., Volume 1, Washington: Government Printing Office, 1861. 839 pp., 5¾ x 8¾ in. “A disloyal portion of the American people have during the whole year been engaged in an attempt to divide and destroy the Union. A nation which endures factious domestic division is exposed to disrespect abroad, and one party, if not both, is sure sooner or later to invoke foreign intervention. 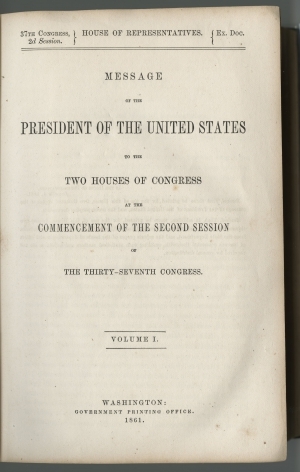 President Lincoln’s first message to Congress, in 1861, immediately follows the title page. In the first year of both his presidency and the Civil War, Lincoln criticizes disloyal citizens who are trying to ruin the country. He acknowledges that the Confederates firing on Fort Sumter ended hope of a peaceful solution, and expresses his confidence in General McClellan. Lincoln also expounds on the foreign affairs, the relationship of labor to capital, and reports on domestic commerce and other affairs. The remainder of the book is over 400 pages of papers relating to foreign affairs and correspondence with other nations and diplomats. The second half of the book is made up of the Reports of the Secretaries of the Interior, War, Navy, and Postmaster General. Good. Original cloth boards with U.S. seal and titled spine, some slight chipping and wear to boards and spine, binding a little loose and front endpaper almost detached, hinges a bit weak, but still firm, some aging, but generally clean internally.